The last time we looked at Phoibos, we examined the very classic PY007 automatic Diver in green. In the meantime, Phoibos has grown. The Reef Master is a watch all their own. It’s a little bit bigger, a little bit beefier. 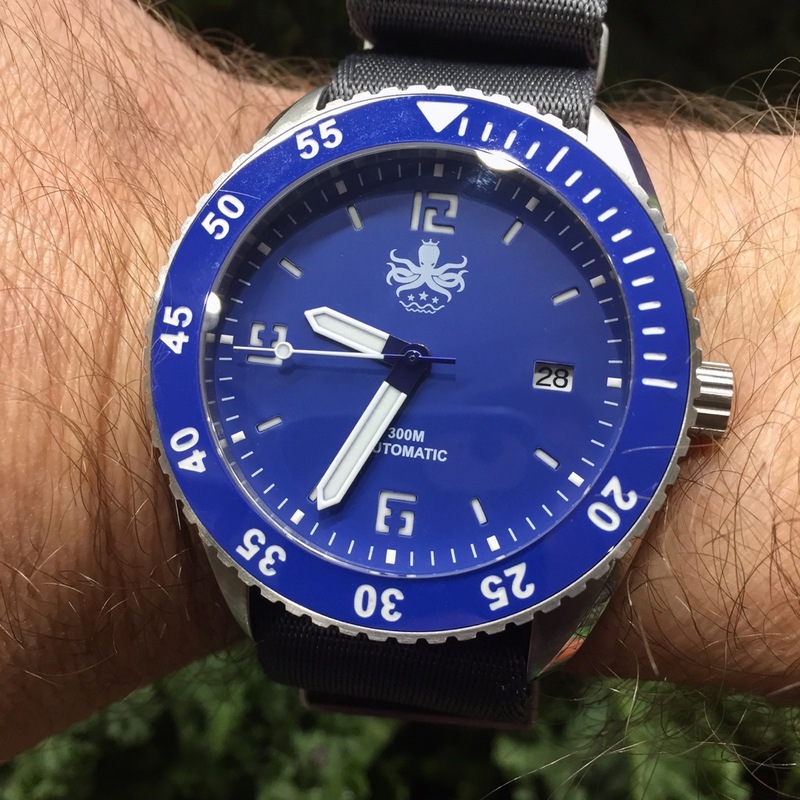 The goal is to get a nice dive watch with an automatic movement for a reasonable price. Can they pull it off? Let’s begin. The Reef Master is a stainless steel dive watch, and has a ceramic bezel. The similarities with the PY007 end there. Reef master is larger. It’s 42mm wide in diameter, 14mm tall. The last time we saw a Phoibos, it was 40mm, 13mm tall. That one had a scalloped bezel, this one is a coin edge variety, like dive watches of old. The lugs on Reef Master are heavily beveled. Let me explain the heritage here: Old dive watches used to have flat lugs, and people would ding them up. When owners would send them in for service, companies would cut a bevel on the lug edge, removing the dings. Later, those same watch companies just applied a thin bevel from the start. Here, Phoibos gives the Reef Master a large, wide bevel that tapers away as it moves from the tip of the lug to the side of the case. The bevel continues on the side of the case, undercutting the bezel. It’s a nice look. The screw down crown stands proud of the case, not surrounded by crown guards. The surface on the crown matches the coin edge grip on the bezel. Somewhere along the way, Phoibos went from a simple text logo, which I liked, to an octopus wearing a crown, surrounded by stars. The logo has a very 1930s feel to me. The logo is repeated on the case back (good), crown (okay), and dial (I dislike.) The logo is very wide, and dominates the top area of the dial between 12 and the canon pinion. It overwhelms the dial, and I wish they’d just stuck with the simple text, or made a logo that was more vertical and narrow. If you want a giant king octopus on your watch, this is the one. The dial is actually nice. It’s a blue with sandwich cut numbers, that glow through from a luminous plate below. Both numerals and hour indices are sandwich cut. The hands are fantastic. They’re pencil hands with the common ball seconds hand. The pencil hands seem a little wider than other watches I’ve seen, and I like it. They have great wide white borders, and large fields of lume. Speaking of lume, the ceramic bezel insert is also fully lumed, and has numerals every 5 minutes, after the initial 15 dive countdown. The Reef Master comes with two straps: A Black Crazy Horse leather strap, and a rubber dive strap. Both are 22mm wide. Honestly, the black Crazy Horse strap wasn’t comfortable for me to wear, and so I placed it on a gray Phenomenato seatbelt style strap, which made it fantastically comfortable and matched the watch well. When you purchase a watch, don’t be afraid to change the strap. The movement running the show is the reliable Seiko NH35a. The NH35 has a well-deserved reputation for reliability. It hand-winds, it hacks, and keeps time all for a great price, which allows us to have excellent watches like the Phoibos Reef Master. For people who like the 42mm size with a look that isn’t copying any specific big brand, the Reef Master is a great choice. Who we think it might be for: You like a dive watch that doesn’t look like a Submariner, but still has classic elements and serious dive capabilities. Would I buy one for myself based on what I’ve seen? : It’s a solid watch. If I could make one design suggestion, it would be: I’m less a fan of the King Octopus logo.